If you’re not Canadian, you might not be familiar with poutine. Poutine is simply hot fries that are thick-cut and topped with your choice of toppings. 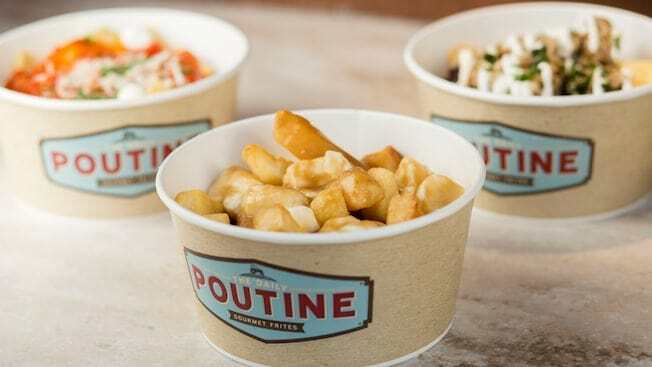 At the Daily Poutine at Disney Springs, you can choose from several different options. The Classic Poutine is fries topped with beef poutine gravy and cheddar curds. The Italian Poutine is fries with mozzarella cheese and Bolognese sauce. Try the French version which includes mushroom sauce and gruyere cheese. The Latin Poutine is fries topped with fried yucca, queso fresco, black beans and pulled pork.